The synopsis of this book compares it to The Fault in Our Stars by John Green which honestly made me a little nervous. I have read so many books by authors who try to write like John Green (who is one of my top 5 writers of all time) and fail miserably. John Green is in a league all his own and I think comparing your work to him is setting yourself up for failure. 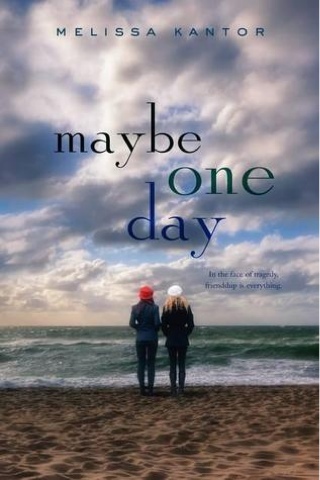 However, I believe the only thing in this book that really reminded me of The Fault in Our Stars is that it deals with a teenager with cancer. This book was completely different and I really ended up loving it. I went in ready to compare the whole book to a John Green book, but I didn't really find myself comparing it at all. So do not go into this book expecting The Fault in Our Stars. It is completely different and a fantastic read all on its own. This story is told from the point of view of Zoe. Zoe and her friend Olivia have been best friends forever and are closer than sisters. They bonded over their love of ballet and have spent most of their lives doing everything together, from attending school to dancing. They are kicked out of their ritzy New York ballet school because they are deemed no longer good enough. They both take the news pretty badly, but Zoe finds it a lot harder to get over and move past. In her mind getting kicked out is the worst thing that will ever happen to her in her life. That is until Olivia is suddenly diagnosed with aggressive leukemia. From the moment Zoe finds out both her and Olivia's lives are changed forever. Olivia fights for her life while Zoe tries to balance being there for Olivia and dealing with her own pain in watching her best friend go through so much pain and misery. This story is 100% about friendship. I love that about it. There is a small sub-plot about a romance between Zoe and Olivia's brother's best friend, but the clear focus is the friendship between these two teenage girls. Their friendship is written and portrayed beautifully and truthfully. Everyone, both teenagers and adults, will be able to relate to their friendship. We have all had that one friend that is basically like your other half and more important than any guy that may come into your life. They have their inside jokes and their own sort of language with one another. I loved reading the quiet, private scenes between Zoe and Olivia. I found myself recalling friends from when I was young and couldn't get enough of their friendship and easy way with one another. I also loved that this book actually explained the medical aspects of the story. I'm a little embarrassed to admit that I didn't fully understand leukemia before reading this book. I had obviously heard of it before, but the book explained this type of cancer in such a way that I totally understood it. It was also explained in such a way that it wasn't a five page rundown of exactly what it is. Kantor explains the disease throughout the story through Zoe's understanding of it. It wasn't a forced explanation that felt out of place, but fit smoothly in the story. I also now have a much better understanding of the treatment and affects of the treatment through Olivia's experience in the story. I think it's important to understand cancer and diseases through the eyes of someone experiencing them firsthand in order to be able to view it as a real thing rather than simply a word and technical explanations. This book really touched me. I found myself thinking about it for days after finishing it. I obviously cried a few times throughout the book, but also found myself laughing too in response to Zoe's and Olivia's inside jokes and easy way with one another. Books about cancer always run the risk of being cheesy and cheap, but this book was real and honest. Kantor leaves you with a lot to think about without being too obvious with her insights and metaphors. Kantor has a perfect balance in her writing of humor, honesty, and thoughtfulness. This book is beautiful and a must read. It will make you sad, but it will also bring you joy and make you rethink and appreciate life in general. The book is 400 pages long, but a very quick read. I am not a huge lover of tearjerkers, but this story is more than just a tearjerker. It is ultimately a story about life, friendship, and love.